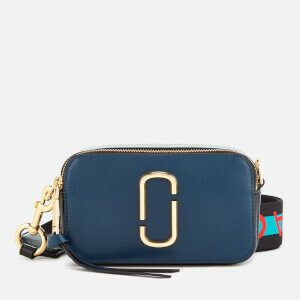 Colourblock crossbody bag from New York fashion house Marc Jacobs. 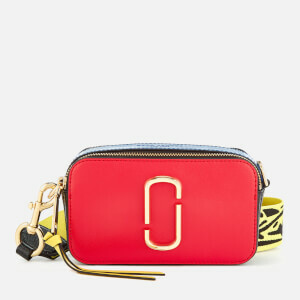 Crafted from textured leather in a bright, multi-coloured design, the camera bag comprises a dual-compartment structure secured by a pair of zip fastenings with elongated zip pulls. Slip pockets feature to the interior and rear of the bag, while an adjustable patterned canvas strap can be removed to create a clutch for versatile styling. The iconic ‘Double J’ logo appears at the front in gold-tone metal. Lined. Arrives with a branded dust bag. Dimensions: H: 10.5cm x W: 18.5cm x D: 6cm. Strap Drop: 69cm.